excellent beauty Very useful when you have many guests. Also great for slow cooking. Monster pan!! This pot has a HUGE capacity. I used it to make enough curry to feed 24 people in one go. It is also brilliant for frying onions and browning meat in when making stews, the whole of the bottom heating evenly. I particularly like how it can be used on both the hob and in the oven. good pan Great for batch cooking - was concerned that it would be too big for practical use but does the job nicely - large pan really shows copper advantage for even heating of food (saving me effort stirring). Fabulous! I absolutely love this pan. It's perfect for cooking large batches of chilli, bolognese - or anything at all. The straight sides mean that nothing 'slops' as it does when using a large saucepan for big quantity cooking. Nothing burns on the bottom and the temperature is easy to control and monitor. If you have friends over often, have a big family or like to cook and freeze portions - this pan is for you. beautiful workhorse This is a large stew pan..... Perfect for a big pot of chili or hearty stew. It's 90 degrees here, so I haven't had the urge to make a stew just yet, but it will be well loved in a couple months when fall comes around. I would recommend the lid as well, given this will be used mostly for simmers, to control the evaporation. It also fits in my warming drawer and will now replace my crock pot for comfort meals and baby food making! it is a gorgeous pan and will make a lovely addition for family meals and gatherings. 868 customers found this review helpful. Did you? Yes, I did! A Behemoth in the Kitchen!! Metals have different heat transfer rates; copper and aluminium are good but each with drawbacks. Falk have mastered this taking heavy gauge copper for great heat properties and bonding it to stainless steel for strength and durability. This stew pan offers huge versatility with its wide flat bottom and gently formed corners it lacks hot spots that burn. It can fry, sauté, casserole with ease and is great on the stove top or in the oven. 14 for dinner, no problem, with its cavernous 7.5 litre capacity there’s plenty of Risotto or Paella to go round. This is a pan for life and will outlive me! 846 customers found this review helpful. Did you? Yes, I did! Fantastic pan With this pan, I now have every size of 'Stew Pan' that Falk offer, and that's because I seem to use them for just about everything. They are not too deep, not too shallow. The curved sides that make stirring/whisking very easy. The 'ear' handles mean I can put them in the oven as easily as use them on the hob. 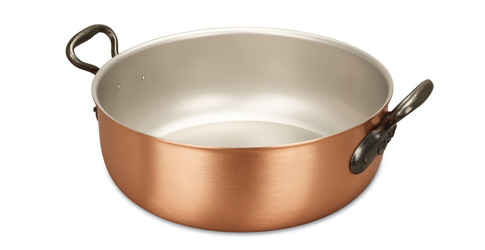 Copper pans are heavy, and the paired handles also make lifting easy, even when full. All of which make these pans, to my mind, the most versatile around. For years, I used the 20cm, 24cm and 28cm Stew Pans for just about everything except pancakes or fried eggs or boiling pasta. This 32cm pan is perfect for making jam, and with its stainless interior I can also use it for large quantities of just about anything else. An absolute pleasure to use. Great for big meals I love this pot for big stews, tomato sauces, even cooking small chickens with the lid on. Mind you, it is very, very heavy and a bother to fit in the sink, but worth it to me. 783 customers found this review helpful. Did you? Yes, I did! Like this product If you wanna cook a dinner for 5 people( for example) this is your right choice! The last time when I cooked " tripe in Rome" I used it and the result was delicious food! When I have more visitor I recommend to cook in this cooper stew pan.